Here at the hospital we work closely with the superb wildlife charity Secret World Wildlife rescue – this teamwork is hugely important in getting wildlife the help and care they need. 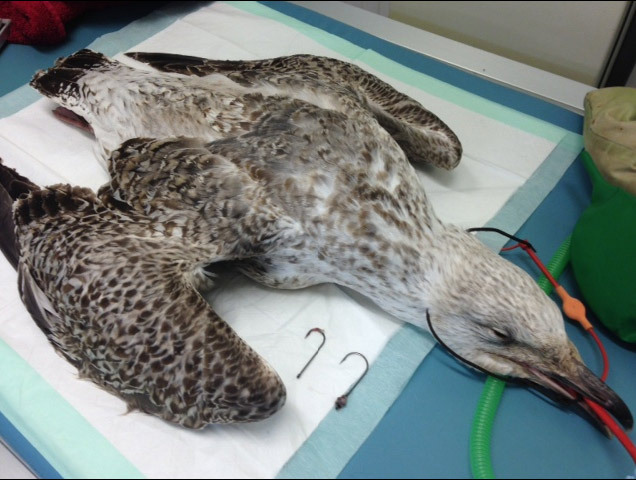 This young greater black-backed gull came into Quantock Veterinary Hospital last week, brought to us by a Secret World Wildlife Rescue volunteer who after a quick examination realised the bird needed urgent veterinary attention. Two fishing lines were hanging out of the birds mouth with the fishing weights attached to the end of them. Vet Hannah and nurse Claire quickly anaesthatised the bird for X-rays to see what was going on. It became clear that the hooks attached to the end of the fishing lines were embedded into the birds gullet and, with barbs on the end of them, they weren’t going to budge easily. They realised that they’d need to be pulled back out! After a long, pain staking procedure both hooks were successfully removed from the birds throat. We’re delighted to say that the bird has gone back to Secret World to be looked after and will be released back into the wild when fit and strong. You could certainly say this little gull bit off a little more than it could chew! Without quick assessment of the bird’s condition, alongside the veterinary care received at Quantock and the supportive care provided by Secret World following the procedure, this could have been a very different outcome for this beautiful bird. We ask that people discard their fishing tackle properly. Carelessness can cause painful and life-threatening injuries to wildlife.